When you right a preview of the Tour of California, you want to be right, but not too much as to make the race unpredictable. While Bernal was a clear winner, this year’s edition still had plenty of drama along the way. There was a lot of youth served, so much that we may look back at this race as being the launching point for many rider’s careers. Even though we had a week full of fun, I also left with the feeling that seven stages isn’t quite enough. Columbian Exposition Award: Before the race, I pegged Egan Bernal as the favorite and the elder 22 year-old Daniel Martinez as a top contender as well. After the dust settled, not only did Columbians win five out of the seven stages, but Bernal walked away with the yellow jersey leaving no doubt on Stage 6. It’s amazing to guess what his ceiling is having accomplished so much against top competition while still learning what he can do at this level. Maybe a grand tour is a bit much for him this year, but I’d sure love for him to have at it! Fall Back Award: Whenever tour organizers are planning stages, do they do it in the fall? Watching Stage 7 in Sacramento was super difficult because those damn trees got in the way of almost every camera angle. It’s not a natural phenomenon! Leaves fall off and grow back. Every year!!! The Greatest Show on Earth Award: Even though Fernando Gaviria took all three of the sprint stages, it was a hot mess picking out the favorites as the finish neared. There was so much firepower out there that the possibilities were endless. Yes, his team looked to be the most organized, but still, his top end speed is nearly impossible to match. Everyone had to scramble through the finish, but the other youngster, Caleb Ewan did an amazing work to keep the green jersey competition close. This race is signaling a changing of the guard. Effort of the Week Award: It silently could have gone to Tejay van Garderen for his impressive time trial, but Tao Geoghegan Hart’s pull on Stage 2 was something to behold. We’re so used to a train of Team Sky riders pushing the pace, but Geoghegan Hart kept up an unbelievable pace up Gibraltar that just shed the top contenders one by one. Bernal effortlessly made his move with 2 km to go, but even after Geoghegan Hart relinquished control, he still finished only seventy seconds off of his teammate. Strong stuff. That Guy Award: I was right prognosticating that the KOM Jersey would again be an indifferent award. When winner Toms Skujins was asked if he set out for the win this week, his answer of,”No, I did not” said it all. At least his win on Stage 3 was a fun one to watch. it’s remarkable that he’s taken victories three times in the last four years on stages with significant climbing, but ending with flat finishes. Those are the wild card races and the ones he excels at. 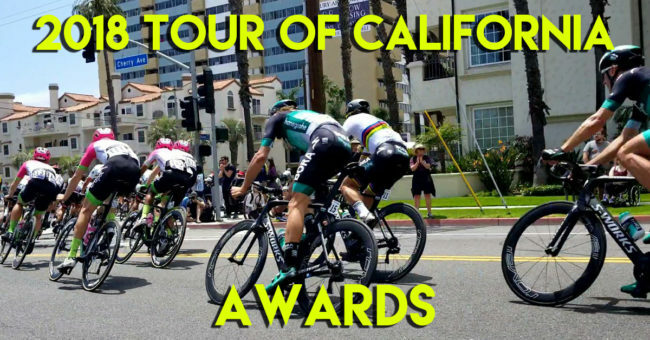 Visit California Award: For the first time this decade, Peter Sagan didn’t win a stage or come home with a leader’s jersey at the Tour of California. Following Kittel on the first stage didn’t turn out to be a good choice, he was no match for Gaviria’s speed on Stage 5 and in the final day finishing fourth is a good showing in all that mess. 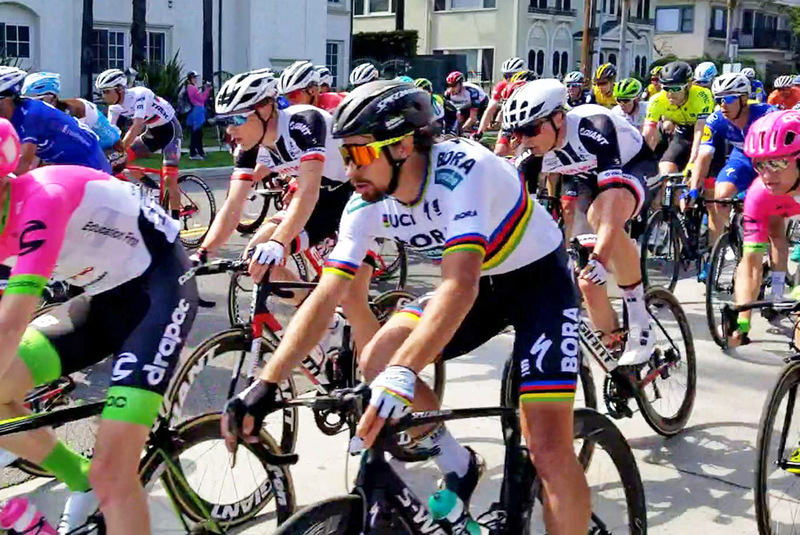 His best chance was on Stage 3 at Laguna Sega, but as his group neared the front, there was little willingness from the peloton to take up work along with vague initiative by Sagan to chase it down. At least he did far better than Mark Cavendish who I hope they don’t give as much airtime in the preview show next year. Throw Me A Bone Award: The final stage was a textbook showing of the importance of the bike throw. In the woman’s race, Coryn Rivera scrambled her way back to the front only to initiate her bike throw just as she hit the line. The bad timing probably cost her a spot on the podium. Meanwhile, in the men’s race, Gaviria appeared to finish second in real time, but watching it in slo-mo he clearly won the race by centimeters. He might have been second a meter in front and behind the finish line, but he showed the value of a properly executed bike throw. The Kids are Alright Award: On top of Bernal and Martinez, this race was quietly dominated by the U25 crowd. Six of the top nine and nine of the top fifteen in the GC qualified for the white jersey. Once again, it was fun to watch the punchiness from Hagens Berman Axeon team with Jesper Philipsen’s rubbing with Gaviria on the sprint of Stage 1, Ian Garrison’s breakaway work on Stage 3 and Sean Bennett’s second place finish after that effort. The American bright spot came from Brandon McNulty for finished seventh overall after turning twenty last month. Gulp.